24 March 2016. Language barriers. I’m beginning to do a comprehensive survey of the extant musical Gilgameshes, none of which is in English. René Clemencic’s recent opera is in German; Nevit Kodallı and Ahmed Adnan Saygun each wrote a Turkish Gılgamış; and Martinů’s oratorio Das Gilgamesch-Epos is in Czech, I think, but in one place it said German so I have to figure out if it’s been performed in translation. For the most part, these works have not gained much critical attention or widespread performance, which means that neither the works themselves nor the discussion about them has been worked into English. I think the Martinů will definitely prove to be the most widely available; for example, there is a recording on the Naxos Music Library that has an English program note. There is a full production of the Clemencic opera on YouTube, with German supertitles visible in the video and therefore viable to translate. The online record of this opera consists of a few reviews of the production, which I’ve read in a rough Google Translate… a decent way to get a sense of it, but not ideal for close analysis. 1 April 2017. Working toward a libretto. Reading the text so specifically for its libretto-ness, however, I found some structural aspects that I thought would need adaptation. Overall, I found that it would need to be made still more succinct to serve as a libretto. 7 April 2017. Presentation, moving forward. I accomplished a lot on my project this week in order to present at the Performing American Lit Mini-Festival last night. Although much of it couldn’t fit into the 10-minute presentation, I’ve now made concrete progress in almost every aspect of my Gilgamesh opera project. The most satisfying part was creating a physical set model. I started with a model of Harkness Auditorium at the Yale School of Medicine, donated by the scenic designer of the last show that I produced (The Cunning Little Vixen, Opera Theatre of Yale College, February 2017). Although this venue has many limitations, and is definitely not where I would choose to produce Gilgamesh, I decided to build my set in this model because it would give me a framework of scale and theatre-shape within which to work. I bought model-building trees (cedars, plausibly, for Humbaba’s forest) and terra-cotta modeling clay from Hull’s, and created some version of the set. It wasn’t a rigorous execution of a specific design, but I enjoyed the freedom to shape my ideas in clay, trying my hand at some impression of cuneiform (with the tip of a steak knife…), and seeing this very hypothetic project finally take some physical form. has eaten the heart of the man. Click for a musical sample from Martinů oratorio (Spotify). 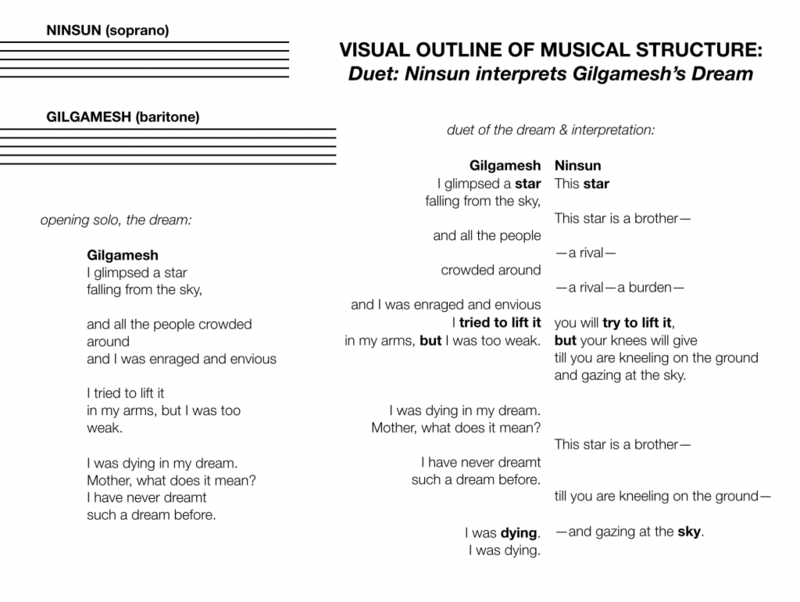 I think the atmospheric orchestration in the beginning and the simplicity of the vocal writing in this lament are so evocative of the way the chorus—the accumulation of so many voices creating and retelling the Gilgamesh story throughout history—observes Gilgamesh from a distance, lyrically present to his grief but with a much wider scope of understanding than his own. I would want the musical setting of my dream duet (outlined textually below) to be inspired by this piece. 21 April 2017. Final project. I’m working on what form my final project will take, and it’s a surprisingly unclear question. Since the entire project is sort of hypothetical—although I’m doing real design & production work, it all depends on the central fiction of an opera that doesn’t exist—there isn’t a clear finish line. Gilgamesh the opera could only actually exist with several more years, a composer and professional designers and singers and technicians and at least tens of thousands of dollars of venue, personnel, and production costs. Given the inherent incompleteness of this project, then, what counts as finished? For the libretto, I have a printed and redacted version of Komunyakaa’s Gilgamesh that is something like a draft. I could work that toward some sort of “finished” libretto, but I don’t think I would discover much by pursuing that draft further; without any knowledge of the composer with whom I as librettist would be working, without the ability to collaborate on the style and intent of the text, it would be working in a vacuum. 2 May 2017. Video of RTI Imaging software.